If you’re paying any attention to world affairs and particularly the current political condition of the United States, it’s obvious that trouble is brewing which could lead to economic collapse or some other SHTF event. But even if you don’t believe that our world could change as we know it, there are still major benefits from becoming more self reliant. Independence from public utilities, the ability to grow your own food, and live off your land without depending on the outside world is a great way to free yourself from the rat race of The American Dream. 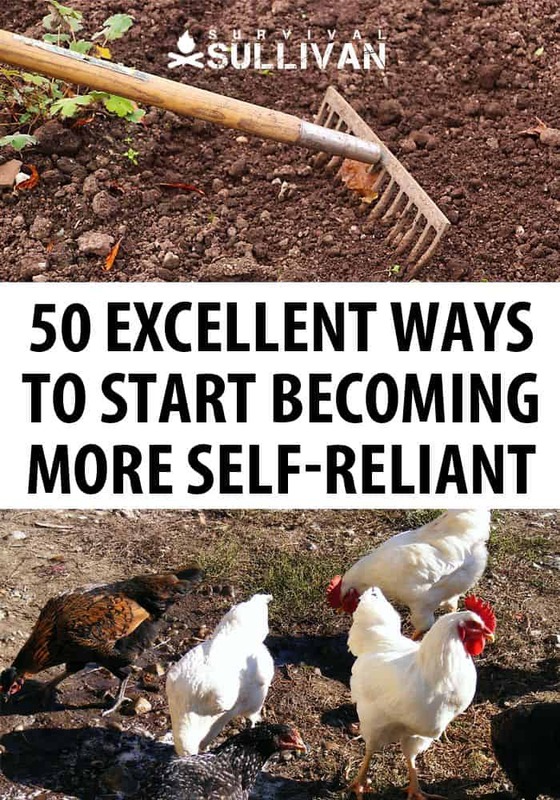 So, if you’re looking to make a change, whether for economic reasons or some other reason, we’ve listed 50 excellent ways to start becoming more self reliant below. You certainly don’t need to do them all at once, simply choose a couple that fit your current situation the best and start there. When you’ve completed or mastered those, choose a couple more and so on. Before you know it, you’ll be living self sufficiently and your family will be better prepared to handle whatever life may throw at you in the future. well on the path to self sufficiency, no matter where you live. #1. Learn a Trade Skill Useful to Others which isn’t dependent on public power or other public services and can be used to barter for needed items, such as carpentry, plumbing, hide tanning, electrical, or woodworking. #2. Increase Your Physical Fitness and Strength which will make doing daily physical tasks easier and will give you an advantage in a self defense or SHTF scenario. #3. Master Fire Starting in All Types of Conditions so that you can cook and keep yourself and family warm in a grid down situation. #4. Train to Forage and Identify Wild Edibles which can save you money in your food budget and be used to supplement your diet if grocery stores are shut down. #5. Learn to Make Cordage from Natural Materials such as vines, grasses, tree bark, etc. #6. Reduce Monthly Expenses by cutting out the services that you don’t absolutely need. Prioritize needs over wants and put extra money into savings or use to pay down debt. #7. Practice Knot Tying which is useful if you have to build shelter, adjust fishing equipment, or for any number of different survival tasks. #8. Begin Composting to lower the amount of waste that you must dispose of and to enhance soil for gardening. #9. Master the Art of Negotiation by learning body language and other types of tells now so you can confidently barter with others during an economic collapse. #10. Learn to Properly Purify Water because in any kind of economic collapse or SHTF situation, fresh water for drinking will be critical to preventing illness and to your survival. #11. Stop Using Disposable Items such as paper towels, paper plates, etc. Although they are more convenient, they cost more money. Invest in linen napkins, hand towels, and washable plates and use these instead. #12. Recycle and Reuse Items to create what you need which will save money and prevent waste from building up in a landfill or in your backyard. #13. Bake Your Own Bread to save money and practice the skill to prepare for a time when grocery stores are inaccessible or shut down. #14. Plant Berry Bushes and Fruit Trees and then dehydrate them for long term storage to save money and add to your family food stockpile. #15. Master Use of Healing Herbs so you can grow your own and use these to keep your family healthy in an economic collapse or grid down situation. #16. Replace Store Bought Cleaning Supplies with Natural Cleaning Methods which is healthier for your family and can save you tons of money which can be put into savings or used to pay off debt. #17. Pay Down Debt as much as possible with a goal of becoming debt free. #18. Cook from Scratch More Often which will save you money and be healthier for your family. #19. Repair Broken Items instead of replacing them with new ones to save money and pay off debt quicker. #20. Learn to DIY Things You Need so you can save money now and be able to make what you need in a grid down or economic collapse scenario. #21. Get to Know Your Neighbors and form a plan to protect your local area and to barter skills and products. #22. Practice Making Useful Items from Scavenged Items so that you can confidently make what you need if traditional ways of getting parts are shutdown. #23. Eliminate Addictive or Bad Habits so that you won’t be dependent on something like cigarettes or alcohol which will be scarce and pricey in times of turmoil. #24. Learn to Repair Your Own Equipment which will save you money on expensive repairmen now and can help you continue to be self reliant when SHTF. #25. Enlist Family and Friends To Create a Mutual Assistance Group which can trust one another to share skills, barter, and join together for defense purposes. #26. Plan for Alternative Ways to Cook without public power such as a wood cookstove, solar oven, or open fire, in case the grid goes down. #27. Raise Poultry for Eggs and Meat to feed your family, sell, or barter with if needed. #29. Learn to Sew both cloth and hides so that you can make your own clothes, generate additional income, or barter. #30. Plant a Garden even if you start small and then gradually expand it until you are producing most if not all of the produce your family needs. Extra produce can also be sold for additional income or used for bartering. #31. Raise Rabbits for Meat as a supplemental protein in your diet. Rabbits can be raised in very little space and without drawing attention from neighbors which is safer in a SHTF situation. #32. Stockpile Staple Foods and Supplies which you can’t produce easily on your property such as sugar, salt, rice, and flour. #33. Master Home Canning and accumulate a stockpile of food in your pantry which can be rotated to save money now and to feed your family in winter months if grocery stores are shutdown or inaccessible. #34. Learn Food Dehydration Methods so you can properly store fruits and other foods long term without refrigeration. #35. Purchase and Learn to Use Manual Tools so that you are prepared to make repairs and maintain your home and equipment to save money or in a grid down situation. #36. Stockpile Auto Supplies so you can maintain and repair your own car instead of paying someone to do it or having to rely on alternative transportation. #37. Make Your Own Soaps to save money, reduce your use of chemicals, and to sell or barter. #38. Reduce Dependence on Public Power by doing without power for increasingly longer periods of time. Can you survive without it for a weekend? A week? Longer? #39. Identify and Plan Alternative Heating Methods so you can heat your home, woodstove, solar power, geothermal, etc. without relying on power from the grid. #40. Build a Traditional Spring House over a creek or well on your property to use for refrigeration of dairy products such as milk and cheese if power is down. #41. Invest in a Backup Generator for times when you need temporary power such as charging electronics. #42. 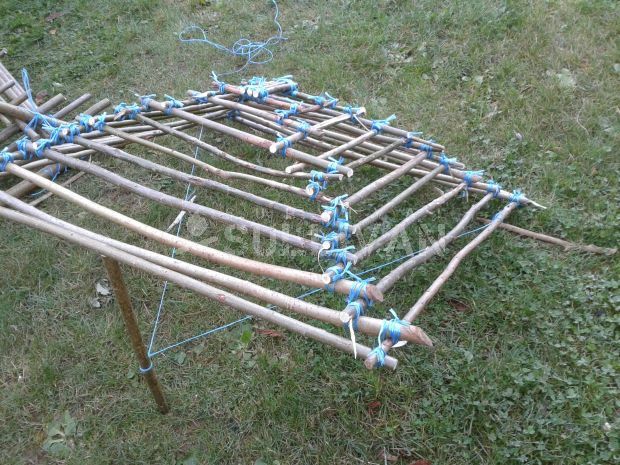 Master Hunting and Trapping Skills to put food on your table but also to use any excess meat or hides for bartering. #43. Learn to Properly Save and Preserve Seeds so that you can produce a garden year after year without dependence on purchasing seeds elsewhere. #44. Build a Root Cellar to store root vegetables and other food for lean times. #45. Make Your Own Cheese and Dairy Products from a dairy cow or goat to supplement your diet and reduce your reliance on grocery stores. #46. Learn to Properly Field Dress Various Game so that you can provide food for your family that won’t make them sick. #47. Practice Firearm Use and Self-Defense so you can protect your family and property from anyone who might try to do you harm. #48. Create an Emergency Fund of accumulated cash to cover your expenses for 3 to 6 months or longer so you can survive any kind of short term personal economic hardship. #49. Identify Additional Ways to Make Money or Produce Items to Barter from your property such as homemade crafts, beekeeping (honey), wormfarm (bait for fishing), etc. #50. Learn About and Implement Animal Husbandry so you can be confident in your ability to continue to produce animals to raise for food and/or for bartering. Which of the above ways to start becoming more self reliant have you mastered already? Which one will you start next? How far have you come on your journey to becoming more self reliant? Let us know in the comments below. The post 50 Excellent Ways to Start Becoming More Self-Reliant appeared first on Survival Sullivan.